The journey to this point: After talking with a colleague who teaches science and had used the flipped classroom the previous year, I decided I would try at the beginning of the 2012-13 school year to flip my three different sections (PreAP Algebra 2, PreAP Precalculus, and Calculus). I convinced Kristina Stevenson to try and flip with me (she will give you a slightly different story) and off we went. Day 1: “We are flipping our classes this year, ready, go!” Little did we know what would happen. Tons of questions about how class would work, what the procedures would be, how would the actual class period go – and we did not have many answers! The kids were resistant for quite a long time, the class structure is totally different than anything that they have previously been exposed to. Parents had some questions and we encouraged this, it drove deeper thinking for us on exactly what we expected to happen as well. Our administrative team was unbelievable in their support of us. They provided professional reading, ideas, things to think about – we could not have done it without them backing us up and letting us try new things. This is one reason why I love teaching where I teach! As the year went on, our school became wireless, BUT if the students were logged onto the wifi through the school network YouTube was blocked by our filtering service. No amount of workarounds were possible, which brought us to BIG PROBLEM NO. 1: what about the kids that do not have internet access on a regular basis outside of school? Our school uses Edmodo as a class learning system, so I went looking through the math group for ideas: Holy Grail: Knowmia.com! What a find, a place to host all of the videos that we posted, we could attach documents to our videos, we could attach internet resources. It became our go to place – best of all: free for teachers and not blocked by filtering service!! BIG PROBLEM NO. 2: how to get those darn kids to do their homework and watch the lesson at home? One of the things that we didn’t want to do is force the student who is as brilliant as Yoda to do the lesson every night. They would not necessarily take notes in class, why make them do it at home. The problem is 80% of my students think that maybe they just might be Yoda….This is no good, there was only one of him! What we started doing in the middle of the year is to allow the students making an ‘A’ to not show their notes. Everybody else got a note check twice a week (as long as I could remember to do it…) and this seemed to help. If you were a student who was working hard and doing the right thing, you picked up a freebie grade. Some kids just flat never bought in and that was okay also in the long run. Kristina and I were able to answer so many more questions last year than ever before. If a student had a question, it got answered! The next few months were filled with a ton of work: recording lessons at school using Camtasia, uploading to Knowmia and YouTube. Trying out different apps on iPad to work on lessons at home. A few of the ones that we liked were Teach (by Knowmia free), Educreations (free), Doceri (free but watermarked), and Explain Everything ($2.99). We used all of them at different times to suit different lessons. I started using Dropbox ALL THE TIME. It was the easiest way to move everything that I did on iPad, home, and school into one location. We were busy and helped each other out. We took turns recording lessons. That way the students were able to hear their teacher, the one they see everyday. We would complement each other in the different types of lessons we created and in the ways that we solved our problems. It turned out to be super beneficial for everyone. As the year went we discovered that it helped to have a blank pdf file of the notes ready, that way the kids had an outline of things that we were going to discuss. We also discovered that sometimes the kids really would not do their “homework” and would save all of the learning process for the classroom. There were times we were both ready to throw in the towel and give it up. But when one person was ready quit, the other was encouraging and we kept going: All Year Long!! By the end we had picked up some new ideas, discarded the things that were not working at all and were looking forward to year number two. So that brings us to year number dos. We are starting off a little bit differently this year: one week of team building followed by one week of modeling expected behavior. Why didn’t we think of this last year??? Who knows, the important thing is that we thought of it this year. 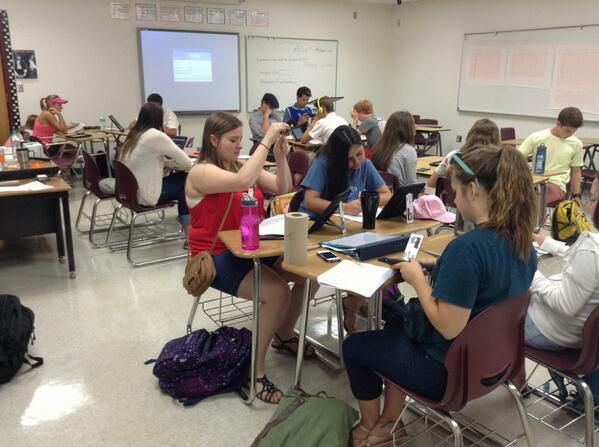 So this is one of my classes and in the pic you can see that several students have iPads out and books open. The first couple of days they just spent time watching the lesson, asking questions and taking notes, all while I hovered over them or kept close watch from my desk. The next thing (thanks again to Knowmia and their super awesome contests) is that all of our big section lessons are now in smaller individual examples. During the spring last year, we cut up our large videos into small bite sized chunks. Now if a student has three free minutes – they can get a lesson. We are also giving the kids one entire unit of work at a time with a deadline for completion. We couldn’t bring ourselves to go the mastery route just yet, but we do like the idea and I think this is something that we will strive for in the future. But now if students are busy on a particular night – they can catch the lesson at a different time. This frees them up as well and allows the student to study better at a time that works for them. We are also going to have our kids post there thinking into Google Docs and comment on each others problems. Students just seem to say things to each other in their own language, that as teachers we sometimes struggle to convey the same thought. Also, it’s sometimes easier to listen to a friend that an adult, so maybe also this “talking” about math will help as well. Kristina and I are also going to try and really use Twitter(@haselwoodmath and @ksteve320) as well: #haselcalc and #memprecalc are the tags we have told our students to use. A tool for closure that I will start using for the kids next week: Tweet one question and one thing learned. It should be fun to see what happens. I have Tweetdeck on my smart board, so the kids get to see the tweets as they come in and its kind of fun. One last thing that we will use this year are QR codes – man they are super handy! We made a really fun teaser trailer for class this year,coded it and put it up outside our classrooms. It was cool to watch the play counts go up (however, half of those were Kristina and I showing people). We used iMovie and the iPad and had the best time recording it. Where do we go from here? Not 100% sure, but I know this, we will continue to improve as teachers everyday, we will always work to help the students be the best that they can be, AND we will talk to anyone that will listen about how much fun we are having doing this!